1. Preheat the oven to 180ºC, gas mark 4. 2. Sift the flour into a bowl then add the butter and rub it in with your fingertips until the mixture resembles fine breadcrumbs. Stir in the demerara sugar, oatmeal and hazelnuts. 3. Arrange the raspberries in a shallow, round ovenproof dish, about 30cm in size. Sprinkle over the caster sugar. Top with the crumble, spreading it out evenly and lightly with a fork. 4. Bake in the oven for 40 minutes or until golden. Meanwhile, warm the custard according to the pack instructions. 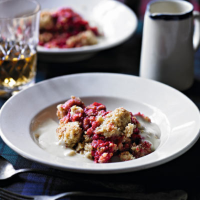 Stir in the Drambuie and serve with the crumble.